The other Instant Pot advantage is that you can use frozen chicken. General guidelines I recommend for fresh/frozen can be found in this simple guide to cooking Instant Pot Chicken! Store leftovers in an airtight container in the refrigerator for 4 days or freeze for up to 3 months. Let thaw overnight in the refrigerator. Rewarm gently in the microwave or on the stovetop, with a splash of water or chicken broth if you'd like to thin the mixture back out a bit. I love this, I don’t have an instant pot but I am guessing if i make the sauce a head of time I could make this in my slow cooker? 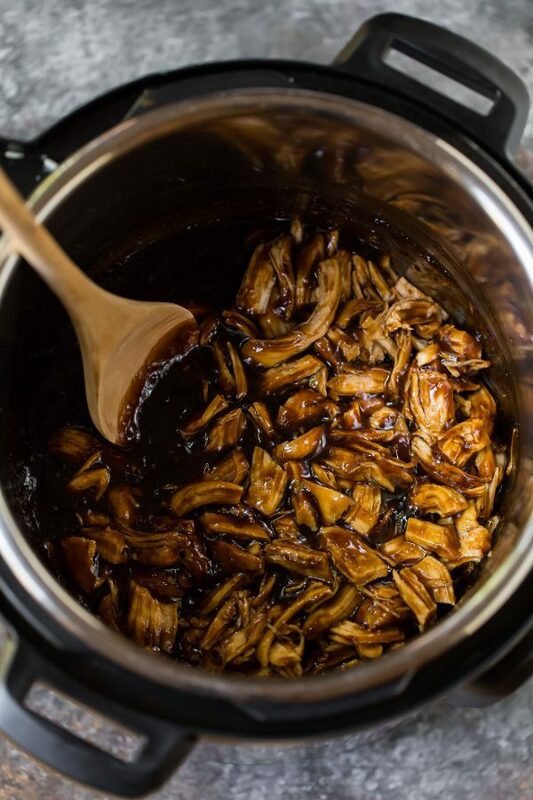 I love making sauces from scratch, and this teriyaki sauce is going on the list to try. I make a homemade sweet chili sauce and could never go back to store bought especially knowing all the extra weird ingredients that are on the label, don’t need to be there. Oh, and I loved the post about how you are developing recipes for you cookbook, just didn’t get a chance to comment. Thanks for what I am sure will be a winner. This sounds insanely delicious! I am still breaking in my Instant Pot and can’t wait to try out this recipe! Addison, this recipe would make the perfect intro. I hope you love it! With the various recipes calling for rice vinegar do you think I could substitute apple cider vinegar Without changing the flavor too much? Kibby, I am afraid rice vinegar is totally unique and has a unique flavor. It especially shines in Asian dishes. It’s not too expensive and available at most grocery stores, so I definitely recommend it here. Quick question! Is step 3 of this assuming frozen chicken (thighs or breasts)? Hi Deniz, the recipe assumes thawed chicken. If you’re starting with frozen, you can scroll up in the blog post for my tips on that! Made this dish last night in my Instapot and my husband really liked it. I also like that this is quick and easy to prepare! Hooray! I’m glad you both enjoyed it, Joann. Thanks for taking the time to leave this review! This was great but pay attention to the recipe and DO use the LOW SODIUM soy sauce. I usually ignore low sodium and use the regular kind. Mine turned out really good, but you could tell how much better it would have been it was less salty. I would also recommend stir frying some water chestnuts, celery and whatever else (maybe cashews) in sesame oil and adding them to sauce after the chicken is done. 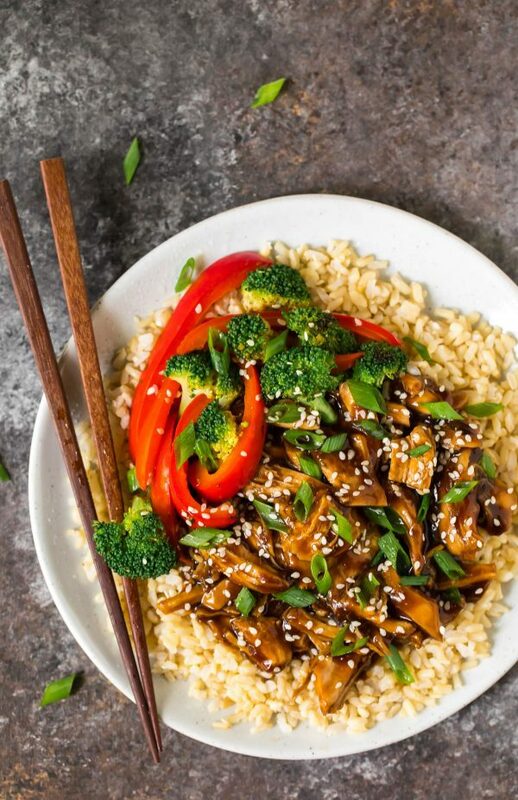 Haley, thank you for chiming in and sharing this (yes, low sodium soy sauce makes it much much easier to control the amount of saltiness), and your additions sound so yummy too! Thanks so much for this DELICIOUSNESS! I made it last night with some friends, and everyone LOVED it! Thank you for this savory, healthy, quick dinner! Whooo hooo! So happy to hear this Erin, thank you! Made this tonight, i thought it turned out really well and the Mrs gave it high praise also. I stir fried some red and yellow onion along with a sweet red pepper in the IP before cooking the chicken. These were added back along with the chicken at stage 5. It Involved a little bit extra time, however kept the washing up to a minimum, happy days. Lots left for lunch tomorrow. Thanks again. I’m happy to hear it was a winner, Roddy! Thank you for taking the time to share this review! So excited to have discovered your website! I’m allergic to garlic and ginger. How do you think the sauce would be without those ingredients? Can you think of something else I could add? I would love to be able to have a teriyaki sauce I can actually eat! Hi Anne! The two add a lot of flavor to the recipe, so unfortunately I’d be hesitant to go forward without them. 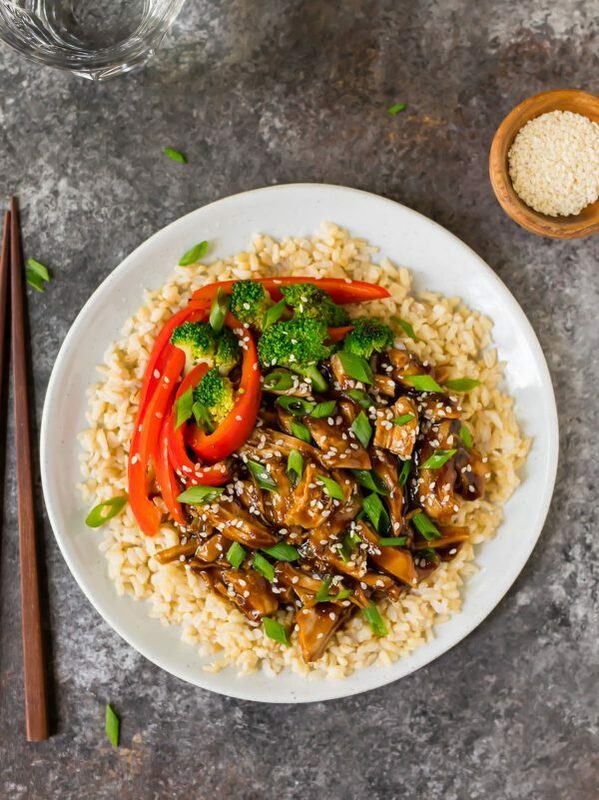 You could check out some of the other stir fry recipes on my site (https://www.wellplated.com/category/recipes-by-type/stir-fries/) to see if there are some that might work better with your needs. I’m sorry to have to say that, but I’d hate for you to make this and not love the flavor. This recipe is absolutely perfect. Everyone with an instant pot should try it! Thank you! I’m so glad you enjoyed it, Angie! Thanks for taking the time to share this review! I’ve made this wonderful recipe many times with chicken theighs. My question is : Can you double the recipe in a 6 qt. instant pot? Hello! I don’t remember exactly how full the IP was, I’m afraid, but I think that there should be room to double! If in doubt, you can always do 1.5 times. This is delicious! I’m going to add this into my meal rotation. I’m so glad you enjoyed it, Stacie! Thanks for taking the time to leave this review! 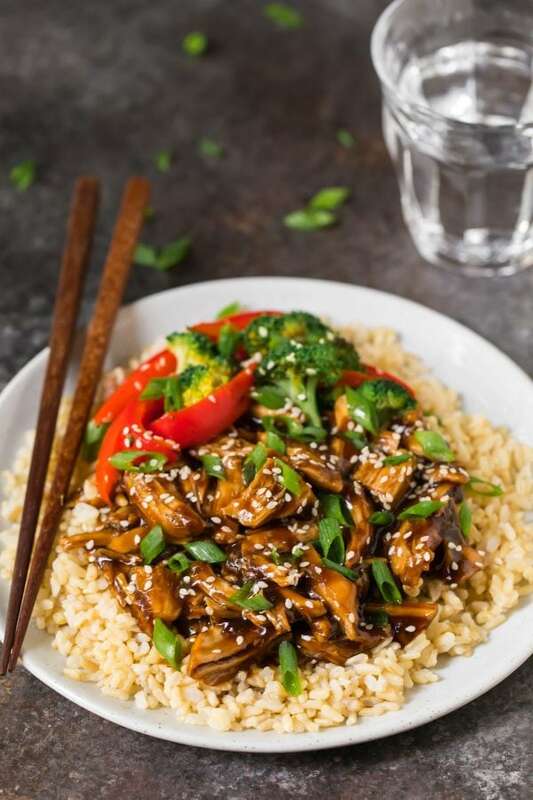 I just got my instant pot and this was the first recipe I prepared, now its a family staple for those busy evenings when you need a second self between sports pick up and dinner. I’m so glad to hear it’s a new favorite, Silke! Thanks for taking the time to share this review. Does the nutritional info include the rice or is this without the rice? Hi Jennifer! It is without the rice. I hope you enjoy the recipe! I used low sodium soy sauce and found this to be too salty and too sweet. The instant pot aspect worked perfectly and I liked how much sauce there was…so I will have to tweak to make a little more tonour taste. Thanks! Alison, I’m glad this recipe will be a good starting point for you. I hope you love it more next time! Lucia, thanks for sharing this review! It should turn out perfectly with the low-sodium sauce.